As flight JQ3 lifts off the runway and turns to take a path along the coast and out to sea, I look out at across the city of Sydney. Bathed in the golden glow of a winter sunset, I look down at the Eastern beaches searching for the iconic crescent shape of Bondi Beach. It’s easy to spot, even from up here it is easily the grandest looking beach along the Eastern suburbs. I look harder, trying to pinpoint the beachfront flat that I had left for good that morning. The flat that, just 7 months ago, I thought I would be spending a lot more time in. Little did I know at the time that my plan for settling in Australia was going to be slightly short-lived. When I first arrived in Australia 8 months ago, having just spent 3 months living in Bali, I was lost. Earlier that year I had resigned from a very well paying, easy, yet ultimately unsatisfying career in banking, I had launched a company to focus on my primary interests of using artificial intelligence to help transform the world and I had left the UK behind to venture out into the unknown lands of the far east. I was under no false assumption back then that leaving the UK to try and settle on the other side of the world whilst making the company work was a sensible plan. Then again, I have never been one to take a sensible option in favour of an exciting option. And so be it that I arrived in Australia in late November without much of an action plan. After spending a month travelling down the coast in a campervan I arrived at my goal of Sydney and quickly settled in to the famous Bondi Beach. At the time it was early January, the height of Australian summer, and the area had a fantastic buzz to it. I was lucky enough to fall into a fantastic crowd of European surfers living around the area and quickly grew to love the place. Summer passed in a blur or camping trips, surf days and skydiving sprees. But by April the best of the Sydney summer time started to pass. The crowds started to dwindle, the weather started to resemble a mild version of London. More importantly, the people who I had met for the summer started to leave back to their respective parts of the world and Sydney settled into hibernation. Australia had also started to show its cracks: for all of the beauty that the country of Australia holds in its nature there are some things that are less than beautiful about it. I started to see that Australia is unfortunately isolated. Not just geographically, you only have to look at a map to work that one out, but also in the political and business sense. Innovation and the willingness to innovate in the country is at least 10 years behind the rest of the world. The sense you get is that Australian policies are actively trying to isolate it from the rest of the planet. By this point I was also starting to formulate a bit more of a plan in my head about where I wanted to be heading with my company. I don’t think anybody likes the feeling of being at a loss of what to do and I was certainly determined to keep trying to drive forward and find a true purpose. I had several clients for my business, but all of these were UK clients I had made before I left. I felt my business was managing steadily but I could not see how I would be able to sustain it if I remained in Australia for a longer term. It was now late June and the glorious isolationist nature of the Australian visa system also began to bear its head. At the same time, the building I was living in developed some maintenance issues and I was faced with the prospect of looking to find another flat to move into in to within the next month (meaning signing another long-term lease). I was ultimately faced with two options: Option 1. I could bite the bullet of commitment and apply for an Independent Skills Visa with my knowledge to stay in Australia. The cost of this however is over $10,000 and it has a 12-month processing period, all whilst also locking myself into a long-term new lease. Or take Option 2. To leave Australia and make my way back to the Europe to attempt to grow from there. The deliberation over these choices took weeks. On the one hand I had made a home for myself and met some amazing people in Bondi Beach. On the other hand, I felt like my purpose was still out there in the world, waiting to be found and my company would not grow whilst I was in Australia (worst case scenario would be if my client base dried up and I was stuck with a commitment to Australia with no opportunities). After weighing up my options and opportunities, I decided with a heavy heart to take Option 2. And leave Australia. I have no more of an idea of my purpose than I did 12 months ago when I left the UK, but at least I now feel I have a more defined plan ahead that Australia right now can’t sustain in the long term. What is this plan? Well, I will arrive back in the UK in late August and from there I will look to scale-up my company. My plan is to try and establish a base – somewhere I can always come back to, in the good times and the bad. As for where I will remain for the long-term? Well that I cannot say. I know I will definitely look to travel more and visit Bondi Beach for prolonged periods in the coming years but that is about as far as the plan stems. The past 12 months have given me not just great experiences, but helped establish a clearer set of principles in my mind – and one of these principles I have come to realise is that for me home isn’t a particular place or country. Home, for me, simply comes down to where the sun sets. The other principle I have come to realise is that the right people can make a place far more special than any beauty the place itself can offer. And the final principle that has been solidified more over the past year: Spend your time doing what you like doing and don’t waste your life on things that you don’t. In the wise words of philosopher Alan Watts; “You’ll be doing things you don’t like doing in order to go on living that is to go on doing the things you don’t like doing. Which is stupid. It is better to have a short life that is full of what you love doing than a long life spent in a miserable way”. Back to the present, and the plane cabin is dark now as I cruise high above the Pacific Ocean in the moonlight. 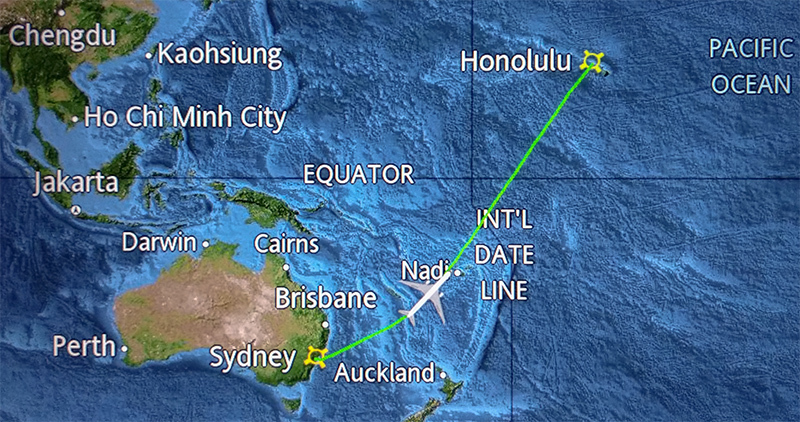 I will soon cross the International Date Line (going back in time – how is that for being a time traveller!) on my way to Hawaii to spend some time thinking about my next steps. In the present moment however the only thought that occupies my head is how I can turn my headphones up loud enough to drown out the screaming child in the row behind me. There’s no point in thinking too far ahead.